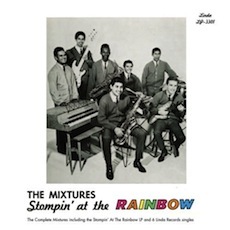 As ‘live’ documents go, as in the type of recording that has the power to convey some of the kinetic energy and mojo of the room, The Mixtures Stompin’ At the Rainbow satisfies on all counts. The thirteen track set feels like a party, and by that I don’t mean its architects just left in some ambient bar-noise, clinking drinks, and conversation, but the actual vibe. Like all nuance, it’s either there or it isn’t, and Rainbow has it in spades. On a sociological level, a big part of the Mixtures story is derived from the fact that they were a multi-racial group during an era (late 1950s and early 60s) when such a thing was relatively unheard of, or, at the very least, considered ‘exotic.’ Formed north of L.A. in Oxnard, CA, the group decamped to the neighborhoods east of Los Angeles, recording Stompin‘ at a club located in the bedroom community of Pomona—the Rainbow Gardens. Combining r&b, proto-rock & roll and (something like) Texas tejano with garage fervor, Stompin‘ captures a bit of the magic that hung in the air on the West coast during this transitional time period. Free of the constraints, and influence, of the East, bands were in a unique position of taking, or leaving, whatever they wanted from the various styles and genres of the period. It goes without saying that this geographic buffer made for some truly interesting output, as evidenced here. In addition to the original live LP, the label has also tacked on the Mixtures singles, both the A and B sides, previously found on The Complete Mixtures. so cool to see something about the mixtures!! read about them a few years back my my LA sociology class, incredible guys that captured a unique time in history, as well a space in history–the rainbow gardens. This is soooo dope. It’s exactly what I was looking for. Thanks buds.